PR Newswire, NORTH CHICAGO, Ill., April 11, 2016 — AbbVie (NYSE: ABBV), a global biopharmaceutical company, today announced the U.S. Food and Drug Administration (FDA) has granted accelerated approval of Venclexta™ (venetoclax) tablets for patients diagnosed with chronic lymphocytic leukemia (CLL) with 17p deletion, as detected by an FDA-approved test, who have received at least one prior therapy.1 The FDA approved this indication under accelerated approval based on overall response rate, and continued approval may be contingent upon verification and description of clinical benefit in a confirmatory trial. 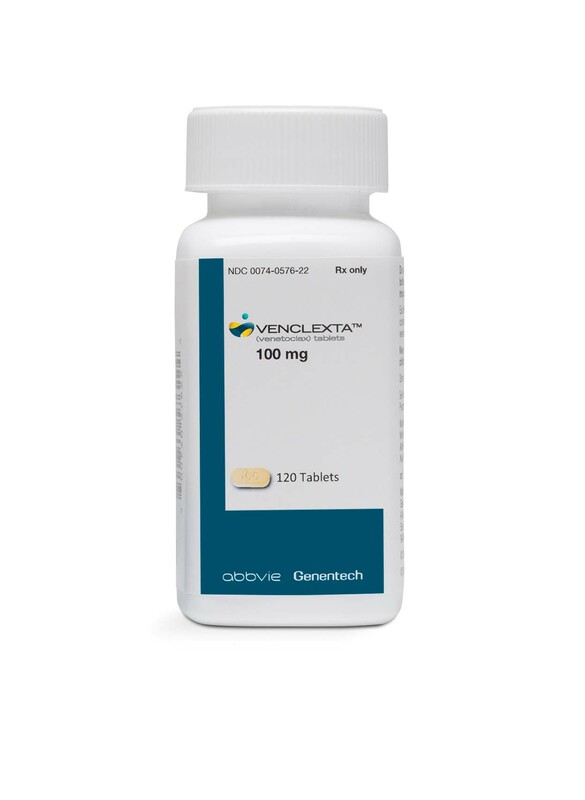 The FDA approved Venclexta as a first-in-class, oral, once-daily medicine1 that selectively inhibits the BCL-2 protein.1 The BCL-2 protein blocks apoptosis (programmed cell death) of cells, including some cancer cells, and can be overexpressed in CLL cells.1 Venclexta is being developed by AbbVie and Genentech, a member of the Roche Group. It is marketed collaboratively by the companies in the U.S. and by AbbVie outside of the U.S.
AbbVie expects Venclexta, a tablet taken orally, will become commercially available in the U.S. within a week. The full prescribing information for Venclexta can be found here. For those who qualify, AbbVie and Genentech plan to offer patient assistance programs for people taking Venclexta. 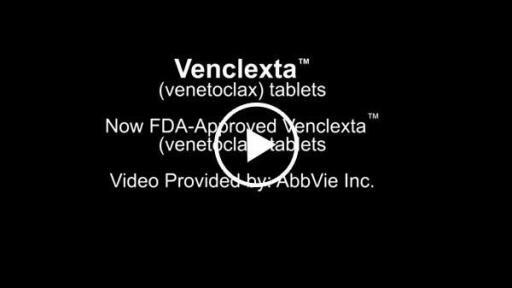 Venclexta is an oral B-cell lymphoma-2 (BCL-2) inhibitor indicated for the treatment of patients with relapsed/refractory CLL with 17p deletion, as detected by an FDA-approved test.1 The BCL-2 protein prevents apoptosis (programmed cell death) of some cells, including lymphocytes, and can be overexpressed in CLL cells.1 Venclexta is designed to selectively inhibit the BCL-2 protein.1 Venclexta was developed in collaboration with Genentech and Roche. Together, the companies are committed to BCL-2 research with Venclexta, which is currently being evaluated in Phase 3 clinical trials for the treatment of relapsed/refractory CLL, along with early phase studies in several cancers. VENCLEXTA™ (venetoclax) is a prescription medicine used to treat people with chronic lymphocytic leukemia (CLL) with 17p deletion who have received at least one prior treatment. Tumor lysis syndrome (TLS). TLS is caused by the fast breakdown of cancer cells. TLS can cause kidney failure, the need for dialysis treatment, and may lead to death. Your doctor will do tests for TLS. It is important to keep your appointments for blood tests. 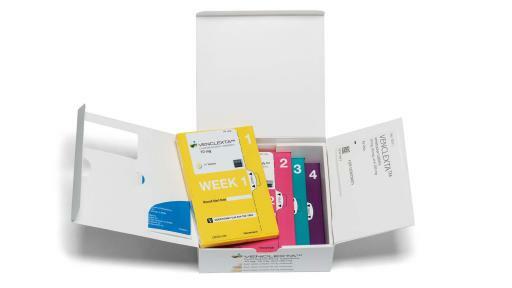 You will receive other medicines before starting and during treatment with VENCLEXTA to help reduce your risk of TLS. You may also need to receive intravenous (IV) fluids into your vein. Tell your doctor right away if you have any symptoms of TLS during treatment with VENCLEXTA, including fever, chills, nausea, vomiting, confusion, shortness of breath, seizures, irregular heartbeat, dark or cloudy urine, unusual tiredness, or muscle or joint pain. Drink plenty of water when taking VENCLEXTA to help reduce your risk of getting TLS. Drink 6 to 8 glasses (about 56 ounces total) of water each day, starting 2 days before your first dose, on the day of your first dose of VENCLEXTA, and each time your dose is increased. Certain medicines must not be taken when you first start taking VENCLEXTA and while your dose is being slowly increased. Tell your doctor about all the medicines you take, including prescription and over-the-counter medicines, vitamins, and herbal supplements. VENCLEXTA and other medicines may affect each other, causing serious side effects. Do not start new medicines during treatment with VENCLEXTA without first talking with your doctor. What should I tell my doctor before taking VENCLEXTA? Are scheduled to receive a vaccine. You should not receive a “live vaccine” before, during or after treatment with VENCLEXTA until your doctor tells you it is okay. Are pregnant or plan to become pregnant. VENCLEXTA may harm your unborn baby. 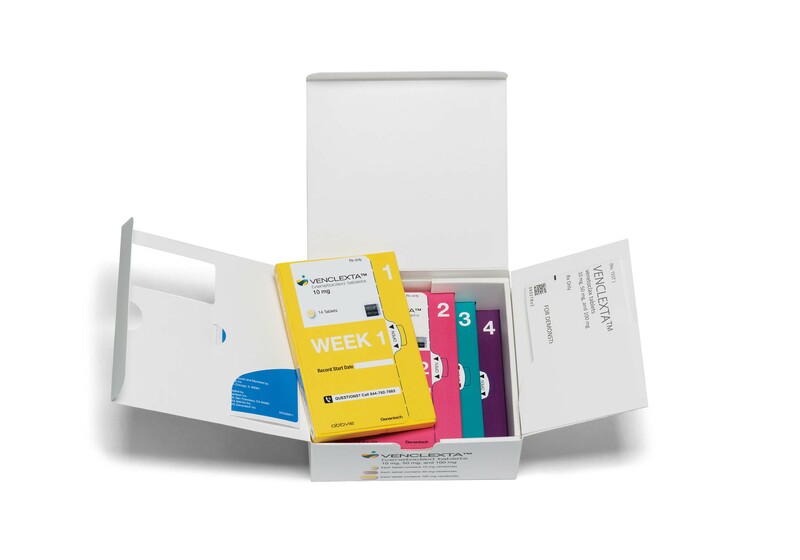 If you are able to become pregnant, your doctor should do a pregnancy test before you start treatment with VENCLEXTA, and you should use effective birth control during treatment and for 30 days after the last dose of VENCLEXTA. Low white blood cell count (neutropenia). Low white blood cell counts are common with VENCLEXTA, but can also be severe. Your doctor will do blood tests to check your blood counts during treatment with VENCLEXTA. Tell your doctor right away if you have a fever or any signs of an infection. 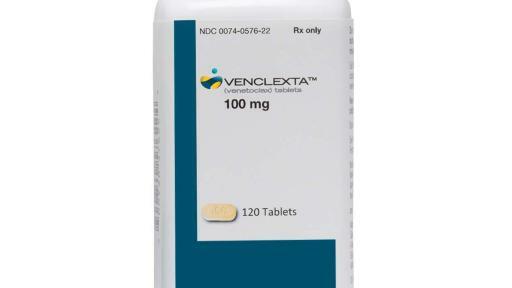 The most common side effects of VENCLEXTA include diarrhea, nausea, low red blood cell count, upper respiratory tract infection, low platelet count, and feeling tired. VENCLEXTA may cause fertility problems in males. This may affect your ability to father a child. Talk to your doctor if you have concerns about fertility. These are not all the possible side effects of VENCLEXTA. Tell your doctor if you have any side effect that bothers you or that does not go away. AbbVie's oncology research is focused on the discovery and development of targeted therapies that work against the processes cancers need to survive. By investing in new technologies and approaches, AbbVie is breaking ground in some of the most widespread and difficult-to-treat cancers, including glioblastoma multiforme, multiple myeloma and chronic lymphocytic leukemia. AbbVie's oncology pipeline includes multiple new molecules in clinical trials being studied in more than 15 different cancers and tumor types. For more information on AbbVie in oncology, please visit http://oncology.abbvie.com. AbbVie is a global, research-based biopharmaceutical company formed in 2013 following separation from Abbott Laboratories. The company's mission is to use its expertise, dedicated people and unique approach to innovation to develop and market advanced therapies that address some of the world's most complex and serious diseases. Together with its wholly owned subsidiary, Pharmacyclics, AbbVie employs more than 28,000 people worldwide and markets medicines in more than 170 countries. For further information on the company and its people, portfolio and commitments, please visit www.abbvie.com. Follow @abbvie on Twitter or view careers on our Facebook or LinkedIn page. Additional information about the economic, competitive, governmental, technological and other factors that may affect AbbVie's operations is set forth in item 1A, "Risk Factors," in AbbVie’s 2014 Annual Report on Form 10-K and in item 1A, “Risk Factors” of Part II of AbbVie’s second quarter 2015 Quarterly Report on Form 10-Q, which have been filed with the Securities and Exchange Commission. AbbVie undertakes no obligation to release publicly any revisions to forward-looking statements as a result of subsequent events or developments, except as required by law. 1Venclexta [Package Insert]. North Chicago, Ill.: AbbVie Inc.
2Sellner L. et al. What do we do with chronic lymphocytic leukemia with 17p deletion? Curr Hematol Malig Rep. 2013;8(1):81-90. 3American Cancer Society (2015). Leukemia – Chronic Lymphocyctic. http://www.cancer.org/acs/groups/cid/documents/webcontent/003111-pdf.pdf. Accessed January 18, 2016. 4Schnaiter A. et al. 17p deletion in chronic lymphocytic leukemia: risk stratification and therapeutic approach. Hematol Oncol Clin N Am. 2013;27:289–301. 5Stilgenbauer S. et al. Understanding and managing ultra high-risk chronic lymphocytic leukemia. Hematology Am Soc Hematol Educ Program. 2010(1):481-488. 6Farrell A. Filing Communication (Priority). Department of Health and Human Services. 2015: 1-5. 7Farrell A. Grant-Breakthrough Therapy Designation (17p del CLL). Department of Health and Human Services. 2015: 1-3. 8Farrell A. Grant–Breakthrough Therapy Designation (CLL).Department of Health and Human Services. 2016: 1-3. 9Farrell A. Grant–Breakthrough Therapy Designation (AML). Department of Health and Human Services. 2016: 1-3. 10U.S. Food and Drug Administration (2015). Frequently Asked Questions: Breakthrough Therapies. http://www.fda.gov/regulatoryinformation/legislation/significantamendmentstothefdcact/fdasia/ucm341027.htm. Accessed March 15, 2016. 11Kozarewicz P. EMEA/H/C/004106/000. European Medicines Agency. 2015: 1-2.